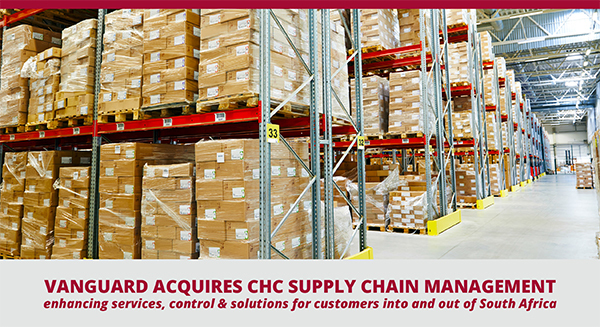 Vanguard Logistics Services is pleased to announce the acquisition of CHC Supply Chain Management, the leading groupage CFS operations and supply chain management organization in South Africa. Adding to Vanguard’s acquisition of International Liner Agencies (ILA), CHC further enhances Vanguard’s presence in the region. The addition of CHC delivers the greatest depth of expertise, services and cargo management for our customers shipping into and out of South Africa – ensuring global control and performance from the world’s largest end-to-end owned NVOCC network. Established in 1987, CHC specializes in the container groupage market offering LCL container unpacking and packing, as well as FCL containers, cross docking, bond stores, customs stops, abnormal unpacks, warehousing and transport. CHC operates customs registered container depots in Durban, Cape Town, Johannesburg, and Port Elizabeth.